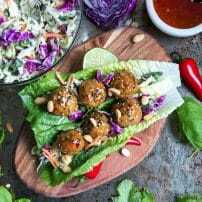 This recipe for Buffalo Turkey Meatballs has been sponsored by Foster Farms Organic Ground Turkey. As always, all thoughts and opinions are my own. 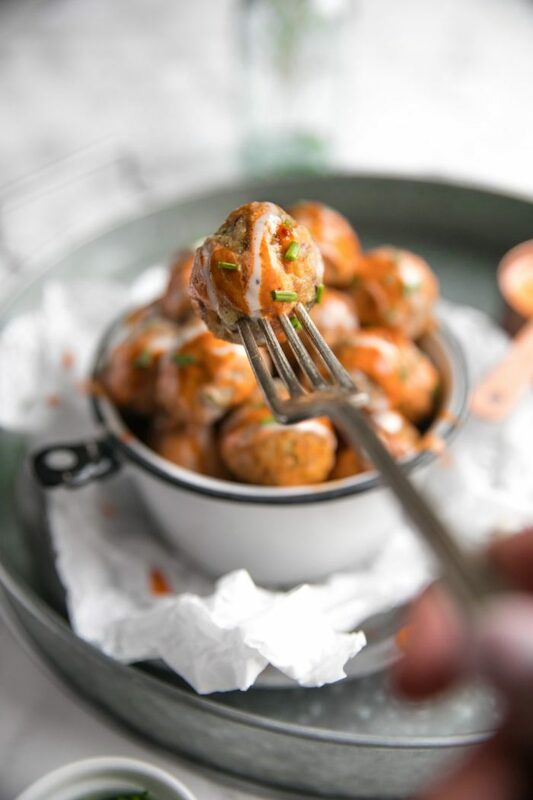 Buffalo Turkey Meatballs are just one of many buffalo sauce recipes here on The Forked Spoon and include other favorites such as The Best Buffalo Chicken Dip, Easy Buffalo Cauliflower, and Instant Pot Buffalo Chicken Quinoa Bowls. 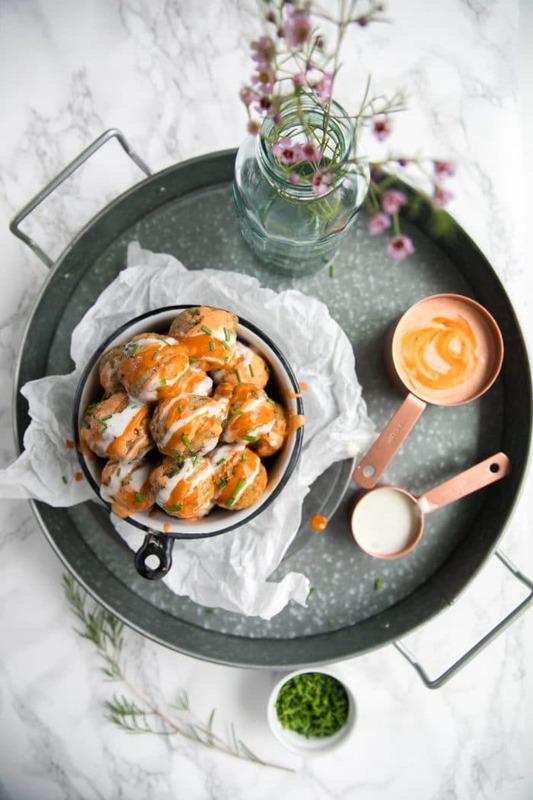 Keeping to my word that Buffalo sauce is my favorite, I have another totally amazing Buffalo sauce recipe for you guys today. I am really excited about these Buffalo Turkey Meatballs with Meal Prep Bowls, and I’m going to tell you all about why. For starters, they’re healthy. I know, what? Meatballs aren’t healthy! How then can meatballs be healthy? Well, most meatballs are made with ground beef which is higher in fat and cholesterol and all that other good stuff (just kidding!). I actually don’t care for ground beef all the much, but I’ll save that post for another day. Anyway, these buffalo turkey meatballs are made with Foster Farms Certified Organic Ground Turkey. 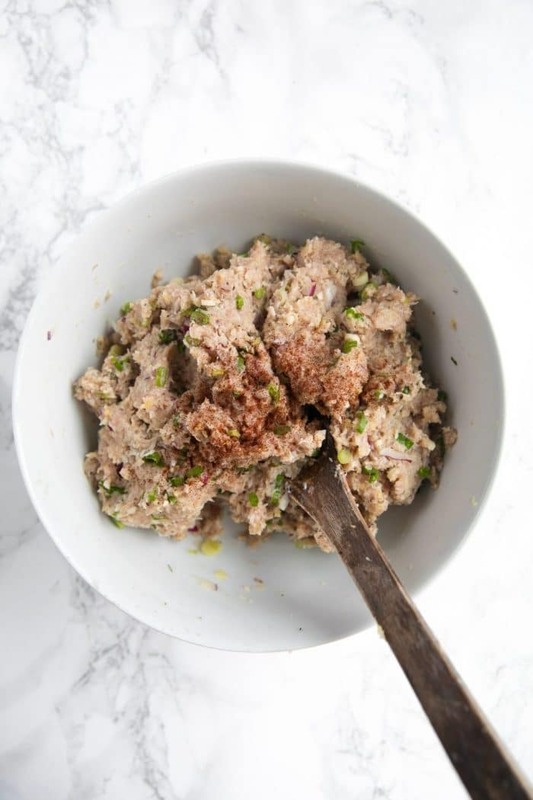 Ground turkey is a personal favorite thanks to its versatility- you can literally put it in anything from pasta dishes to soup, eggs, pizza, and, of course, tacos. Let’s just say we eat a lot of ground turkey around here. WHY YOU NEED THESE BUFFALO TURKEY MEATBALLS IN YOUR LIFE. They’re actually healthy. Remember how I mentioned that they’re made with ground turkey rather than ground beef? Yep. The Buffalo Sauce. Yes, that’s actually been healthified, too! But really, these Buffalo Turkey Meatballs, my friends. You need them in your life. As mentioned above, I made a couple modifications to the Buffalo Sauce. If you’re not purchasing a favorite pre-made buffalo sauce, you will have to make your own. I’m going to be honest- when I first started making recipes with buffalo sauce I was totally confused by this. I really don’t understand what made it so confusing for me, but alas, there I was. Anyway, you will need Frank’s Red Sauce. It’s basically what you use if you’re not buying premade stuff. Just trust me on this. Usually, Frank’s is mixed with a bunch of butter and the result is the magical, beautiful Buffalo Sauce of your dreams. Well, since we all know how much I love my sauce, I knew I needed to health it up a bit. The magic ingredient? Greek yogurt! You guys, the result is just as delicious, just as magical, and just as addicting. So, if I am going to constantly purchase, cook with, feed my family, and write about a product, I have to really love it. What about Foster Farms Organic Ground Turkey is so great? 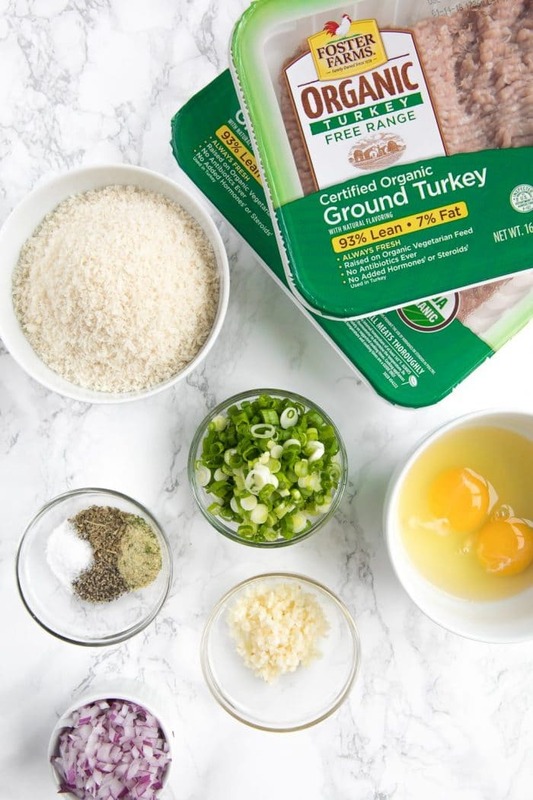 Foster Farms Organic Ground Turkey is raised in the Central Valley of California (aka home). All Foster Farms Organic turkeys are raised 100% natural with NO antibiotics ever, NO GMO’s, and NO added hormones or antibiotics. These turkeys are lean. Ok, at least the ground turkey is lean. 93% to be exact. Available all over CA, WA, and OR, not to mention more than 225 West Coast Stores. Ever wonder what it takes to be labeled “Organic”? In order to qualify as USDA Organic Ground Turkey, Foster Farms must meet a handful of very important and strict regulations. The land on which flocks are raised has been certified organic. This requires a 3-year transition during which time the land must be managed under organic conditions or lie fallow. No use of genetically modified organisms (GMOs). All flocks are raised WITHOUT the use of antibiotics or growth hormones. Flocks have access to the outdoors. That said, the ranch houses in which they are raised must provide shade; clean, dry bedding; shelter; fresh air; clean drinking water; and direct sunlight. The land is farmed without synthetic pesticides, herbicides, and fertilizers. Turkeys are fed an organic, all-natural, vegetarian diet. 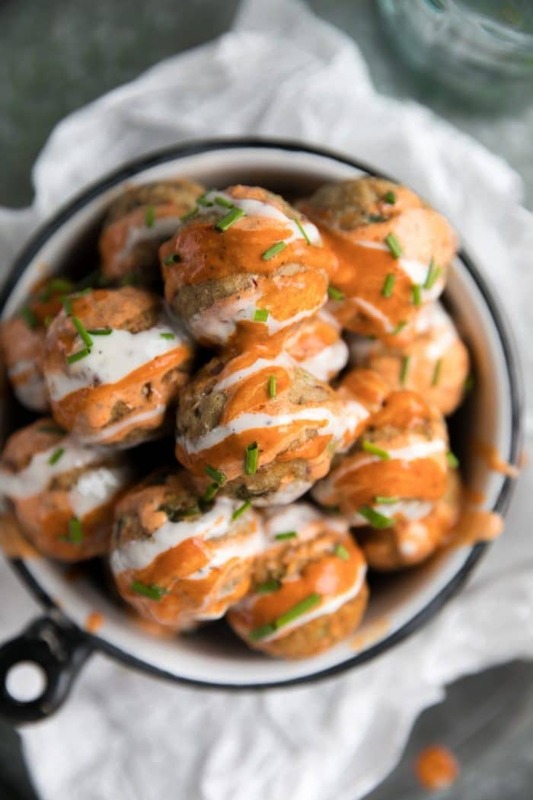 These Buffalo Turkey Meatballs are the PERFECT thing for Meal Prepping. If you’re like me and either skip lunch or end up grabbing something totally unhealthy, creating Meal Prep Bowls at the beginning of the week with leftovers is an awesome way to keep yourself on track. They help keep portions balanced and force you to eat what you have. Fortunately, Buffalo Turkey Meatballs keep really well in the refrigerator all week and pair perfectly with just about anything from noodles, rice, quinoa or even, cooked spaghetti squash. Basically, Buffalo Turkey Meatballs + Meal Prep are made for each other. Plastic cups with lids– these little cups will keep things like salad dressing, sour cream, guacamole, etc. separate from the other food. This is especially important when meal prepping salad bowls as the last thing you want for lunch is soggy lettuce. Planet-Friendly Reusable Dipping Sauce Cups with Lids– perfect for salad dressings or dips, these adorable little containers are leak proof and reusable! Spork– if you’ve ever wondered where the name of my blog came from…Anyway, attach this to your keychain or backpack and take it everywhere. Reusable Insulated Water Bottle– I have several different brands. I have carried the same Kleen Kanteen for years, but I love my Insulated Rtic Water Bottle because it keeps ice frozen forever. Meal Prep Bowls: You will need something to store and hold all your delicious Buffalo Turkey Meatballs, right? These are my recommendations. Glass Meal Prep Containers with 2 Compartments– Having two compartments is perfect if you prefer to keep flavors separate from each other, or you want to prevent a sauce from making something soggy. These glass meal prep containers are freezable, microwavable, and dishwasher safe. Glass Meal Prep Containers with 1 Compartment– One giant compartment perfect for Burrito Bowls, Pastas, or this Chicken Fajita Meal Prep Recipe. These glass meal prep containers are freezable, microwavable, and dishwasher safe. For non-glass options, you can try these BPA free Bowls or Single Compartment Containers. Other recommended items that will help make planning easier and help the environment! In a large bowl add the Foster Farms Organic Ground Turkey, Panko breadcrumbs, eggs, garlic, chopped red onion, salt, black pepper, Italian seasoning, onion powder, and green onions. 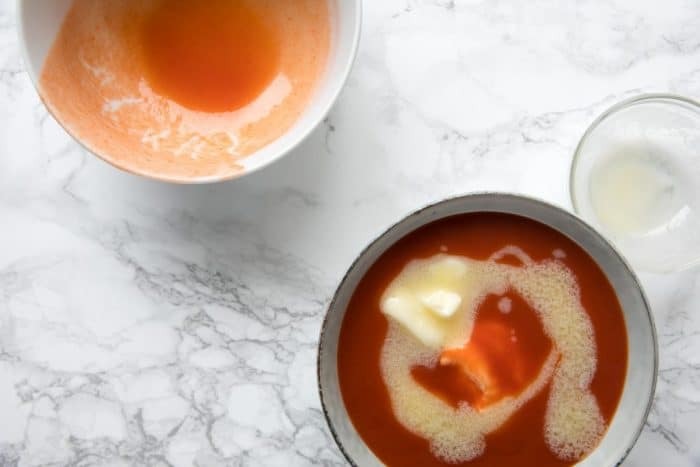 Using clean hands (or a mixing spoon), work the ingredients together until fully combined. 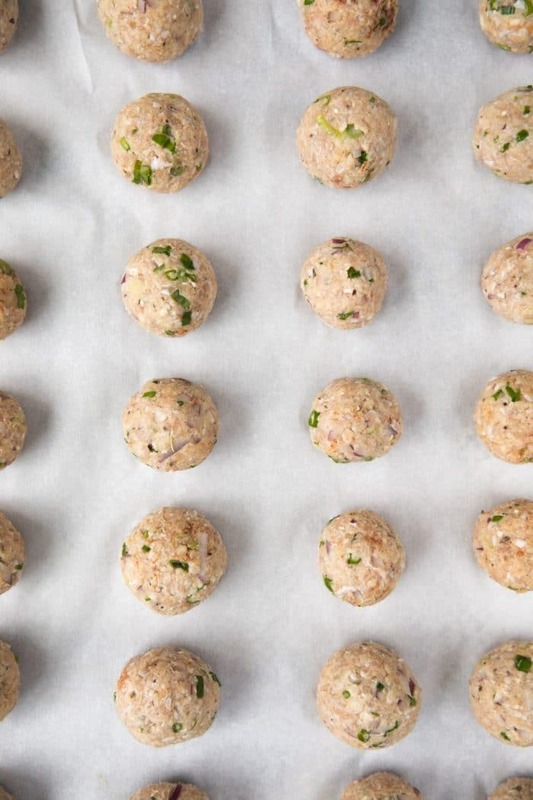 Roll the combined ground turkey mixture together into approximately 1 1/2-inch meatballs. Repeat this process until all mixture has been used, creating approximately 32 meatballs. 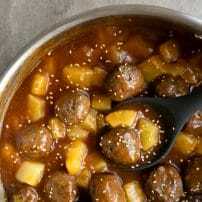 Place meatballs onto the prepared baking sheet and bake for approximately 25 minutes, or until outside is golden, cooked and internal temperature registers 160 degrees. 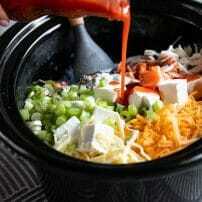 In a medium bowl combine the hot sauce and melted butter. Once combined, stir in the Greek yogurt. Set aside in the refrigerator until ready to use. Remove the meatballs from the oven and allow them to cool for 3-4 minutes before transferring to a large bowl. 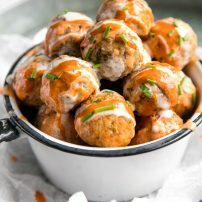 Gently toss to coat the meatballs with half the buffalo sauce mixture and garnish with fresh chopped chives, if desired. Serve with noodles, rice, or (shown here) spaghetti squash. 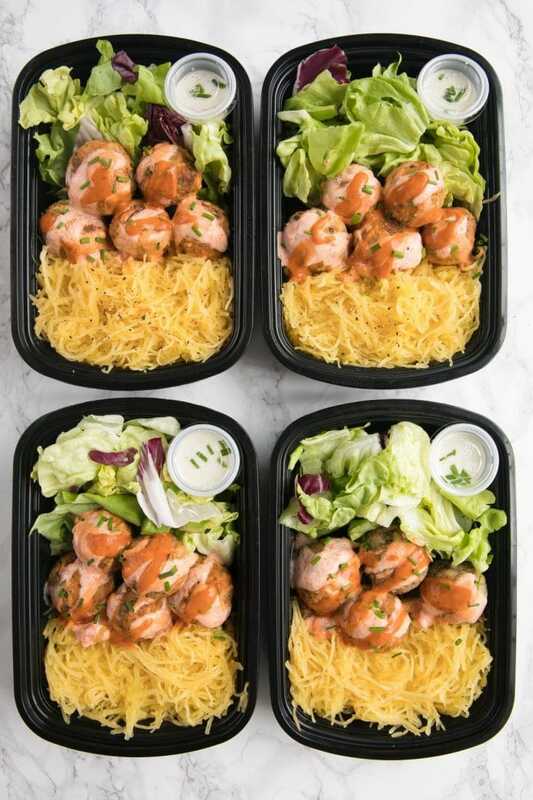 For the meal prep bowls- Add the desired amount of spaghetti squash, salad, and Buffalo Turkey Meatballs to reusable lunch containers. I added approximately 1 cup cooked spaghetti squash, 5 meatballs, and 1/2 cup salad. 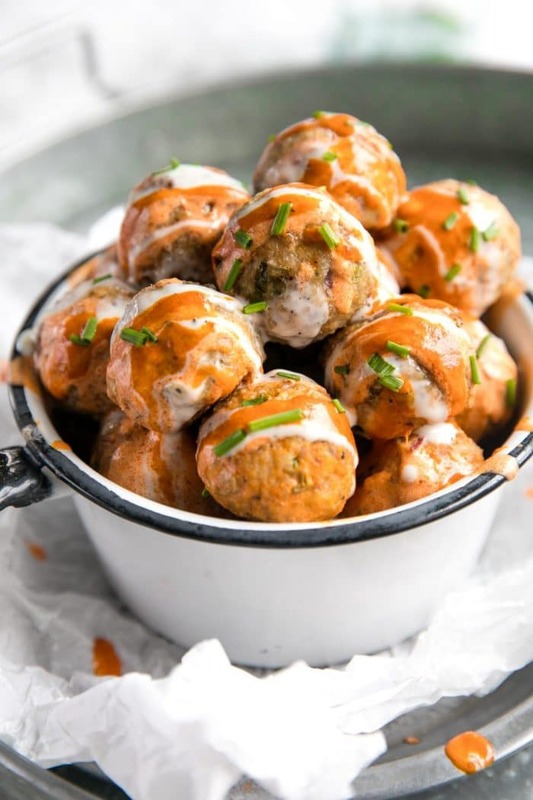 Drizzle the meatballs with additional Buffalo sauce and pack with a side of Ranch Dressing or Blue Cheese Dressing, if desired. In separate ziplock bags, pack a handful of carrot and celery sticks. Store all containers in the refrigerator until ready to enjoy. The Nutritional information per serving reflects one meatball with sauce only - not the rest of the sides for the meal prep. For these meal prep bowls, I used these reusable meal prep containers with lids and these mini disposable cups with lids for the sauce. Please note- in an effort to reduce waste, I will be researching a more environmentally friendly option (especially when it comes to the sauce containers), but for now, these little plastic cups work fantastic. Thank you for sharing this! I made this tonight and it was delicious! I can’t wait to have it for lunches this week! I am tracking my meals for weight watchers. Does the nutrition card include the sauce as well or only the meatballs? Good question. Yes, the Nutrition card includes the sauce – it includes all ingredients listed. I have made different kinds of Buffalo sauce before and so I must admit, I was fairly skeptical when I saw it was only 3 ingredients. Let me tell you though, it was delicious! I used Siggi’s plain yogurt instead of Greek because it is what I had on hand. I packed these in my meal prep containers with some steamed broccoli, matchstick carrots, and cauli rice. So delicious! Thank you for sharing! Oh and side note- they do make mini (1.5oz) storage containers for sauces,dressings, etc. that are dishwasher safe to help you reduce waste! I love mine and use them all the time! Hi there I was wondering if you eat the meatballs cold or how do you reheat it for meal prep? Hi Chase! You can eat the meatballs cold or warm them up- it’s totally up to you. To reheat, I recommend heating in a microwave-safe dish covered with a damp paper towel for 30-second intervals until they have reached your desired temperature 🙂 Hope that helps! Enjoy.